The Rockford Metropolitan Agency for Planning (RMAP/MPO) is now part of Region 1 Planning Council (R1PC), a regional organization that combines key public sector operating entities into shared assets for planning, fund development, and research. R1PC is comprised of the MPO, the Economic Development District, and Geographic Information System. Want to learn a little more about the MPO? Check out the About Us Page. Interested in the current activities of R1PC? Check out the lastest announcements below. To report website issues, please email us at Web Administrator. Thank you for visiting or website. We hope your stay is informative and enjoyable. The draft of the MPO FY 2020 Unified Work Program (UWP) is now available for review. This document lists the transportation planning activities that the MPO will undertake in FY 2020. A public comment and review period for the FY 2020 UWP will be from March 15th, 2019 – April 15th, 2019. Please feel free to contact Jon Paul Diipla, AICP with any questions..
CANCELLED: Due to severe weather conditions, the 2050 Metropolitan Transportation Plan workshop scheduled for WEDNESDAY, JANUARY 30, 2019 at Machesney Park Village Hall has been cancelled. This workshop may possibly be rescheduled for a later date. If the meeting is rescheduled, details will be posted on the Region 1 Planning Council’s website and social media accounts. If you have any questions, please contact Sydney Turner at 815-319-4185 or by email at sturner@r1planning.org. This evening’s 2050 Metropolitan Transportation Plan workshop has been cancelled due to the recent winter storm the region has experienced. Originally scheduled for January 23rd at the Byron Public Library, the workshop may possibly be rescheduled for a later date. If the meeting is rescheduled, details will be posted on the Region 1 Planning Council’s website and social media accounts. Region 1 Planning Council (R1PC) had begun work on the 2050 Metropolitan Transportation Plan (MTP), the update to Transportation for Tomorrow (2040): A Long Range Transportation Plan for the Rockford Region. Public engagement is central to the development of the MTP and we are committed to engaging the public and stakeholders in a variety of ways. Become a part of the development process by helping us identify the transportation needs, investment priorities, and other factors that will shape the transportation network over the next 20 – 30 years in Boone, Winnebago, and northern Ogle Counties by taking a short survey or attending one of our workshops. Comments and thoughts on the current 2040 LRTP or the 2020-2050 MTP can be provided to R1PC by calling (815) 319-4180 or by email. Region 1 Planning Council (R1PC) had begun work on the 2050 Metropolitan Transportation Plan (MTP), the update to Transportation for Tomorrow (2040): A Long Range Transportation Plan for the Rockford Region. Public engagement is central to the development of the MTP and we are committed to engaging the public and stakeholders in a variety of ways. Become a part of the development process by helping us identify the transportation needs, investment priorities, and other factors that will shape the transportation network over the next 20 – 30 years in Boone, Winnebago, and northern Ogle Counties by taking a short survey. The Transportation Needs and Priorities Survey is now available online at http://r1planning.org/mtp/. R1PC will also be hosting several public workshops throughout the region towards the end of January 2019. More details on the workshops will follow. The MPO Technical Committee meeting scheduled for Thursday, December 20,2018 (10:00am) at the City of Loves Park City Hall has been CANCELLED. If you have any questions, please do not hesitate to contact Jon Paul Diipla at 815-319-4180 or by email at jpdiipla@r1planning.org. The MPO is seeking public comments on its draft of the Title VI & Environmental Justice Considerations Plan and the Limited English Proficiency Plan. The draft documents will be available for public comment from November 16th, 2018 through December 17th, 2018. The draft Title VI & Environmental Justice Considerations Plan can be accessed here. The draft Limited English Proficiency Plan can be accessed here. Comments should be direct to Margaret Campbell at 815-319-4180 or by email at mcampbell@r1planning.org. The MPO Technical Committee meeting scheduled for Thursday, November 15,2018 (10:00am) at the City of Loves Park City Hall has been CANCELLED. The MPO Technical Committee meeting scheduled for Thursday, September 20, 2018 (10:00am) at the City of Loves Park City Hall has been CANCELLED. The next scheduled meeting of the MPO Technical Committee will be held on Thursday, October 18, 2018 at 10:00 AM at Loves Park City Hall, City of Loves Park City Hall, 100 Heart Boulevard, Loves Park, IL 61111. The public comment and review period from MPO FY 2019 –FY 2022 Transportation Improvement Program draft document was from July 18th, 2018 through August 13th, 2018. The document can be viewed on the MPO website and a link to the document is provided here. This document will be discussed at the August meetings of the MPO Technical and Policy Committees. The MPO has released its Annual Notice of Planning for Fiscal Year 2019. Click here to review the notice. The Region 1 Planning Council, in its capacity as the Metropolitan Planning Organization (MPO) for the Rockford metropolitan area is responsible for programming various federal and state transportation funding programs. The MPO is now accepting applications for the Transportation Alternatives Program (TAP). The call for projects is from April 5th, 2018 – May 11th, 2018. All project applications must be completed and submitted to the MPO no later than 5:00pm on May 11th, 2018. The transportation alternatives program guidance and application packet further detailing eligible projects, sponsors, local match requirements, and funding available for this call for projects can be accessed here. This document describes the competitive application and selection process that the MPO will use to solicit, select, and award federal TAP funds that are sub-allocated to the MPO as authorized under the Fixing America’s Surface Transportation Act (FAST Act) Transportation Alternatives (TA) set-aside. The TAP Program Guidance & Application Packet can be accessed here. The TAP Application Form can be accessed here. A map of the MPO planning area can be accessed here. The goal of TAP is to allocate resources to well-planned projects that provide and support alternate modes of transportation, enhance the transportation system through preservation of visual and cultural resources and improve the quality of life for members of the communities. TAP requires communities to coordinate efforts to develop and build safe, valuable and functional projects in a timely manner. Please contact Jon Paul Diipla, AICP or Sydney Turner with any questions. The MPO Mobility Committee meeting scheduled for Tuesday, April 10, 2018 at 10:00a at the RMTD East Side Transfer Center has been CANCELLED. The draft version of the MPO FY 2019 UWP is now available for review and can be accessed here. The public comment period for the MPO FY 2019 UWP will be from March 26th, 2018 until April 17th, 2018. Comments should be direct to Jon Paul Diipla at 815-319-4180 or by email at jpdiipla@r1planning.org. The MPO Technical Committee meeting scheduled for Thursday, March 22, 2018 at 10:00a at the City of Loves Park City Hall has been CANCELLED. The MPO Mobility Committee meeting scheduled for Tuesday, March 13, 2018 at 10:00a at the RMTD East Side Transfer Center has been CANCELLED. Region 1 Planning Council (R1PC) and Transform Rockford are hosting a community conversation to share the regional Bicycle & Pedestrian Plan’s recommendations, next steps, and proposed collaborative strategies to achieve the vision of being a bicycle and pedestrian-friendly region. The event will include a panel discussion, an update on current infrastructure planning for the future, and a summary presentation on the new bike-sharing program coming to the region. Plan recommendations include the five E’s of bicycle and pedestrian-friendly communities: Engineering, Education, Encouragement, Enforcement, and Evaluation. The plan integrates programs, policies, and infrastructure recommendations to implement and improve walking and bicycling in our region. Due to the anticipated snowstorm, we have decided to cancel the Public Participation Plan Open House scheduled for February 8, 2018 at the Regional Design Center. Comments on the plan are still being accepted through February 16th, 2018 via email, telephone, or sending written comments. Please contact Sydney Turner or Jon Paul Diipla with any questions regarding the draft Public Participation Plan. The MPO Mobility Committee meeting scheduled for Tuesday, February 13, 2018 at 10:00a at the RMTD East Side Transfer Center has been CANCELLED. The full public notice regarding these open houses can be accessed here. Public comments will be accepted regarding the PPP from January 2, 2018 until February 16, 2018. Comments can be submitted to the MPO through email, telephone, or sending written comments. Please contact Sydney Turner or Jon Paul Diipla with any questions regarding the draft Public Participation Plan. The draft MPO Public Participation Plan is now available. It can be accessed here. Public comments will be accepted regarding the PPP from January 2, 2018 until February 16, 2018. Comments can be submitted to the MPO through email, telephone, or sending written comments. Please contact Sydney Turner or Jon Paul Diipla with any questions regarding the draft Public Participation Plan. The MPO Technical Committee meeting scheduled for Thursday, December 14, 2017 at 10:00am at Loves Park City Hall has been CANCELLED. The MPO Mobility Committee meeting scheduled for Tuesday, November 14, 2017 at 10:00a at the RMTD East Side Transfer Center has been CANCELLED. Transportation affects each of us, each day, but not in the same way. That is why it is essential that a wide variety of individuals, businesses, and organizations are engaged in the regional planning process and that their voices are heard. We want YOU to let us know the best way for us to inform you about transportation planning activities. The survey is available at http://www.surveygizmo.com/s3/3532524/Public-Involvement-Survey. The survey will be remain open until November 30th, 2017.. The MPP Technical Committee meeting scheduled for Thursday, October 19, 2017 at 10:00a at Loves Park City Hall has been CANCELLED. If you have any questions, please do not hesitate to contact Jon Paul Diipla at 815-319-4183 or by email at jpdiipla@r1planning.org. The final adopted versions of the FY 2018-2021 Transportation Improvement Program (TIP) and the Bicycle & Pedestrian Plan for the Rockford Metropolitan Area are now available. Click here to view the FY 2018-2021 TIP. Click here to view the Bicycle & Pedestrian Plan. If you have any comments or questions regarding the documents, contact Jon Paul Diipla, AICP. Comments on MPO documents are accepted at any time. The MPO Mobility Subcommittee meeting scheduled for Tuesday, September 12, 2017 at 10:00a at the RMTD East Side Transfer Center has been CANCELLED. The draft MPO FY 2018-FY 2021 Transportation Improvement Program (TIP) is now available. The draft document can be accessed here. The public comment and review period for this draft will be from August 22nd, 2017 through September 15th, 2017. The FY 2018-FY 2021 TIP is scheduled for tentative adoption by the MPO Policy Committee at their September 2017 meeting. Please contact Anna Ma, Metropolitan Planner, with any questions regarding the draft MPO FY 2018 – FY 2021 TIP. The final adopted version of the 2017 MPO Coordinated Public Transit-Human Services Transportation Plan (the Coordinated Plan) is now available. Click here to view the document. If you have any comments or questions regarding the Coordinated Plan, contact Jon Paul Diipla, AICP or Ivy Hood. Comments on MPO documents are accepted at any time. Representative John Cabello and R1PC MPO will be hosting an open house for Secretary Randy Blankenhorn, Illinois Department of Transportation and Director Greg Bedalov, Illinois Tollway on Monday, July 31, 2017 from 11:00a-1:45p and held at the City of Loves Park, City Hall (100 Heart Boulevard). Please join us in welcoming Secretary Blankenhorn and Director Bedalov back to our region and participate in an open dialogue on the transportation needs for the region. If you have any questions, please do not hesitate to contact the R1PC MPO Office at 815-319-4180. MPO has released a draft of its Bicycle and Pedestrian Plan for the Rockford Metropolitan Area, which is now available for public comment. You may review the draft by clicking here. Public comment will be afforded for the Bicycle and Pedestrian Plan from July 20, 2017 until August 21, 2017. Comments can be submitted electronically by emailing MPO staff, by sending written comments to the address provided below or by attending an MPO public meeting. R1PC MPO has released a draft of its Coordinated Public Transit Human Services Transportation Plan (Coordinated Plan), which is now available for public comment. You may review the document by clicking here. Public comment will be afforded for this Coordinated Plan from April 21, 2017 until May 31, 2017. Comments can be submitted electronically by emailing MPO staff, by sending written comments to the address provided below or by attending an MPO public meeting. The MPO Technical Committee will be open for public comments regarding the Coordinated Plan at its May 18, 2017 meeting. The MPO Coordinated Plan is tentatively scheduled for adoption, with the inclusion of comments made during the public comment period, at the June 29, 2017 meeting of the MPO Policy Committee. To review the notice of this public comment period, click here. The MPO Coordinated Plan is intended to identify needs and gaps in public transportation services, particularly for seniors, individuals with disabilities, individuals with low incomes, and other transit‐dependent populations in the MPO Metropolitan Planning Area. The MPO Coordinated Plan and attachments will additionally be used to guide the expenditure of regionally allocated Federal Transit Administration funds from the Section 5310 Enhanced Mobility for Seniors and Individuals with Disabilities Program. Priorities for implementation based on resources (from multiple program sources), time, and feasibility for implementing specific strategies and/or activities identified. The Draft MPO Coordinated Plan can be reviewed by clicking here or by contacting MPO staff via the contact information provided below. *The Open House at the Keen Age Center will also feature an available lift-equipped bus for attendees to board and a supervisor from the Boone County Council on Aging will be on hand to answer questions about buses or the Boone County Council on Aging itself. The draft of the MPO FY 2018 Unified Work Program (UWP) is now available for review. Click here to view the document. This document lists the transportation planning activities that the MPO will undertake in FY 2018. A public comment and review period for the FY 2018 UWP will be from March 30th, 2017 – May 1st, 2017. Please feel free to contact Jon Paul Diipla, AICP with any questions. The Illinois Department of Transportation (IDOT) has released its Consolidated Vehicle Procurement (CVP) 2017 Rolling Stock Capital Assistance Application. A PDF of the document is available below, along with the appendices. As it has in the past, the local 5310 Application process will use this document, and MPO will seek guidance from the Mobility Subcommittee to determine if any further submission material is necessary. As was the case in the previous two cycles, applications from agencies operating within the MPO Urbanized Area are only eligible to utilize funds from the local apportionment. At this time, MPO intends to review applications for the FY 2016 apportionment of $267,486. This will be discussed at the March 14th, 2017 MPO Mobility Subcommittee meeting. To facilitate the Mobility Subcommittee discussing all applications and providing its recommendation at its regularly scheduled meeting on May 9th, 2017, completed applications are due to MPO no later than 4:00PM on May 01, 2017. Administrator’s Note: Some of these files may not open in-browser depending on factors beyond the MPO’s control such as the version or update the status of your browser of choice. It is possible that one of the below files may bring up the following message: “Please wait… If this message is not eventually replaced by the proper contents of the document, your PDF viewer may not be able to display this type of document.” If this should occur, download the file to your computer and attempt to open it with your PDF viewer. This should resolve most issues without the need for a browser update. For any further technical problems, please contact The Administrator. FY 2017 IDOT CVP to be used for local 5310 application process. g) Any and all documentation materials referenced and/or requested in application Section(s) III, V, VI and/or VII. For any questions, please contact Michael Hren. RMAP has approved the final 2017-2020 Transportation Improvement Program. To review the document, click here. For comments on this draft, please contact Sydney Turner. Comments on RMAP documents are accepted at any time, but for inclusion into this cycle of the TIP, comments should be submitted by August 16, 2016. The Rockford Metropolitan Agency for Planning (RMAP) is kicking-off the Rockford Metropolitan Area Bicycle & Pedestrian Plan update. The purpose of the plan is to provide a regional vision for a comprehensive infrastructure system that will support and encourage walking and bicycling throughout the Rockford Metropolitan Planning Area (MPA). The plan will provide a framework for improving connectivity, safety, convenience, and attractiveness of bicycle and pedestrian networks. To review the notice, click here. RMAP thanks interested parties for their input at the June public open houses. RMAP anticipates another round of public open houses this fall. More information on the Rockford Metropolitan Area Bicycle & Pedestrian Plan can be found at the RMAP Bicycle and Pedestrian page. The final adopted version of the 2017 RMAP Unified Work Program is now available. Click here to view the document. If you have any comments or questions regarding the UWP, contact Jon Paul Diipla, AICP. Comments on RMAP documents are accepted at any time. RMAP has released its annual notice of planning for fiscal year 2017. Click here to review the notice. The Illinois Tollway has announced the completion of the full-access Irene Road Interchange on the Jane Addams Memorial Tollway, also known as I-90. For more details on this subject, visit the Illinois State Toll Highway Authority’s website. The RMAP meeting schedule for 2016 has been released. This schedule is for the RMAP Policy Committee, Technical Committee, and Mobility Subcommittee. Click here to view the document. The approved 2016 RMAP UWP has been posted, and is available here. The approved 2016-2019 RMAP TIP has been posted, and is available here. The approved RMAP EJ & Title VI document has been posted, and is available here. The approved RMAP Limited English Proficiency Plan has been posted, and is available here. The RMAP Policy Committee has approved the final version of the updated 2040 Long Range Transportation Plan (LRTP). To view the document, click to visit the LRTP page. 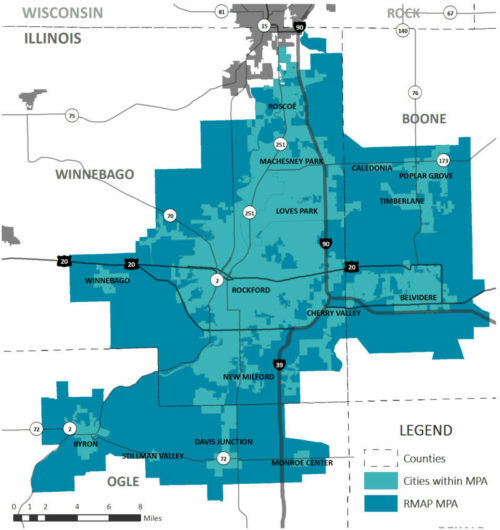 The Transportation for Tomorrow (2040): A Long Range Transportation Plan for the Rockford Region was recommended by the RMAP Technical Committee at their July 23rd, 2015 meeting and adopted by the RMAP Policy Committee at their July 30th, 2015 meeting. RMAP would like to thank all of our partner organizations and the public for all of input, comments and participation received during the development phase of the Long Range Transportation Plan update. Questions regarding the LRTP may be sent at any time to RMAP via the emails on the staff page or by mail or in person to 313 N. Main Street, Rockford, IL 61101. The Illinois State Toll Highway Authority has announced long-term lane closures scheduled at Illinois Route 173 and East Riverside Boulevard on the Jane Addams Memorial Tollway (I-90) north of Rockford. For more details, view the release. The RMAP-created Functionally Classified Road Map is now available in digital format. Click here to view it. RMAP has released a memorandum detailing the change in phone numbers for RMAP staff. To view the memorandum, click here. RMAP has published a study regarding freight traffic and transportation in the region. To view the freight study, click here. If you have questions or comments regarding the freight study, please contact Gary McIntyre, Metro Program Manager. RMAP has received a HUD Sustainable Communities Certificate, in commemoration of the progress and accomplishment of the Sustainable Communities Grant. To view the certificate, click here. The Illinois State Toll Highway Authority has released a number of fact sheets regarding improvements being undertaken on I-90, including a Corridor Overview, a Construction Traffic Flyer, an overview of the work being done on the Business 20/State Street Interchange, and a By the Numbers Overview. For more information, visit the Illinois State Toll Highway Authority’s website. The League of Illinois Bicyclists has released a Rockford Area Bike Map. To view the map, click here. Commonwealth Edision has released information regarding the Energy Infrastructure Modernization Act. For an overview, click here. For details on Winnebago and Boone counties, click here. An interactive map detailing the congestion levels of the arterial roads in the RMAP Region has been released. To view this map, click here.